Inspiration | House by the water. Every woman and her dog writes a blog these days. 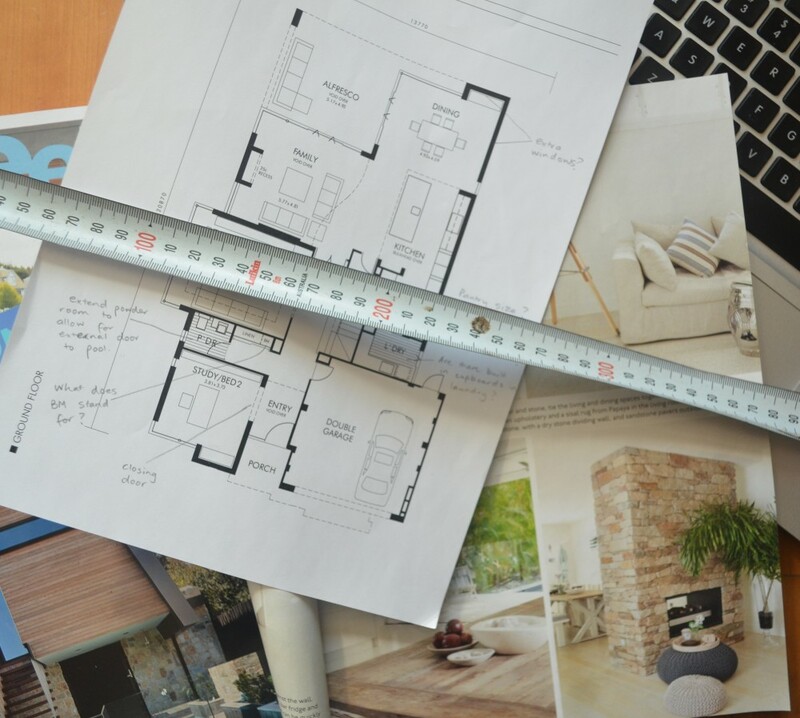 There are literally thousands of blogs documenting home building, renovation and decoration but with a bit of sifting, you can find a good community of like-minded people sharing tips, referrals, encouragement and inspiration. A couple of friendly home-building bloggers sent their readers my way and posed me some questions. Trixee, half of a motivated duo building a modest but glamorous solar passive home in Perth, from Eco Home Style. Sheilzy, a go-get-em chick who’s building a Metricon home in Sydney, from Our Hudson. Kerrie-Lee, the world’s most patient builder’s wife, who is building a very stylish home in coastal NSW, from eternalicons. Thanks for the plug, girls! I started my first blog 4 years ago when we moved to China for the interest of our extended family. I enjoyed keeping a record of expat life and playing with words. I caught the blog bug. 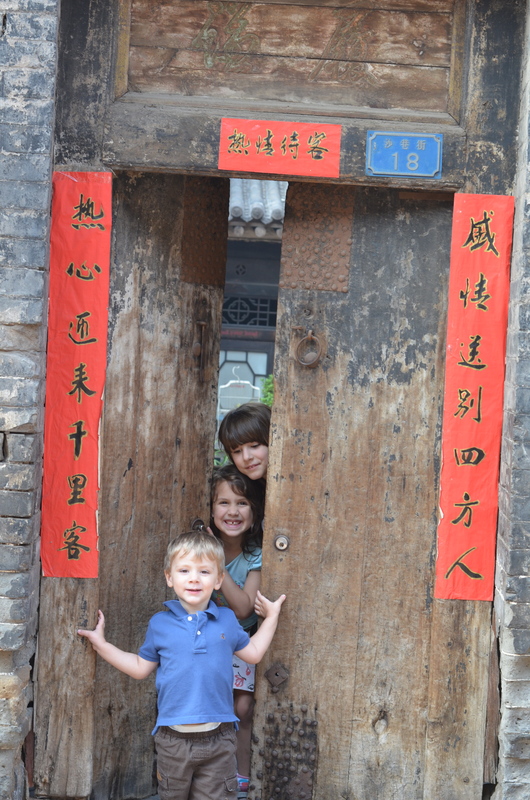 Photo from my first blog: The 3 Little Pigs in China. 2. What are your favourite 3 blogs and why? Spacecrush – I only recently discovered interior stylist, Jane Ledger’s blog, and the timing is perfect for me. Jane, who is Perth based, shares her passion, knack and skills for interiors with unusual generosity. I’m lapping up her “how to” series of articles such as “How to hang art” and “Choose the right sofa”. House Nerd – You already know I love House Nerd for her rambling stories about interesting homes, DIY projects and local creatives in Western Australia. Maya always keeps it real and affordable and I’m guaranteed a laugh, often at Maya or Mr. Nerd’s expense. Maya reminds me that I’m glad that we are over the reno phase of life, but that it was good for us! Third place was tough- so I’m going for a tie between The Design Files, for wholesome Aussie homes with lots of heart and character, and Planet Deco for an endless supply of beautiful homes, mostly from Europe . 3. What’s your favorite post that you’ve written and why? 40 decades of houses because it was such a nice trip down memory lane. Exposed brick and psychedelic green! 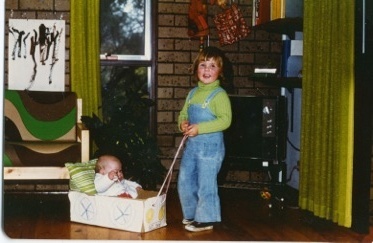 That’s Aunty Kate in the box, and I’m towing. Check out my art. I haven’t improved. The connections made with readers. We are helping each other blunder our way through home building. The banter is fun and the tips are helpful. 5. How do you find things to blog about? Somehow I always have at least one month’s worth of blog topics up my sleeve. Ideas come to me naturally as part of the building process, often while I’m doing the dishes! So far I’ve resisted writing the: “I can’t wait to have a dishwasher” post. 6. What do you hope to achieve from your blog? Make sense of the building process. Make good decisions by “thinking out loud”. Maximise the enjoyment of the building process, however remote I may be. 7. Describe your favourite meal. 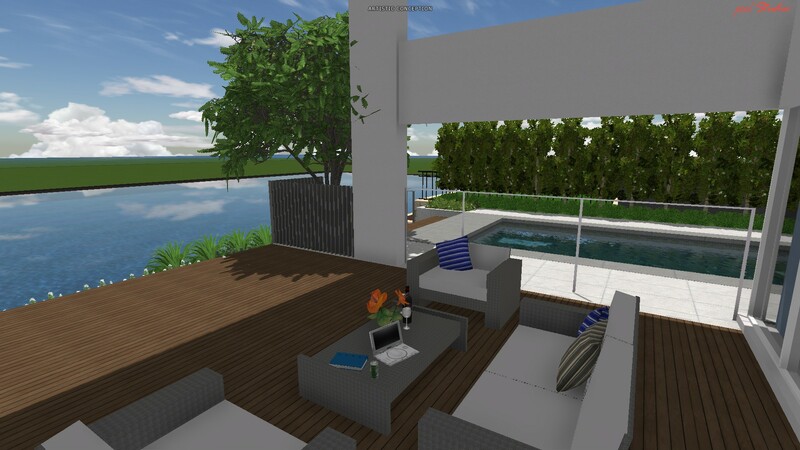 Landscape design for House By The Water by Tim Davies Landscaping. 8. If you had a day to do anything you want, what would you do? 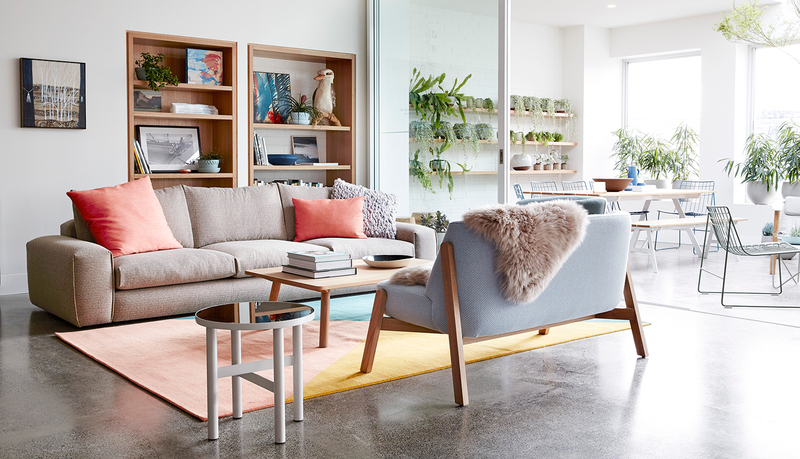 I would go homewares and furniture shopping in Melbourne with Aunty Kate (my sister). We would, of course, have an unlimited budget. We’d meet my Mum and my other sister for lunch at Cumulus Inc to drool over the lamb and the interior design. Kitchen counter at Cumulus Inc.
We’d visit Mark Tuckey, Jardan, Southwood Home, and Weylandts. 9. What are your current obsessions? Blue, preferably dark and moody. Linen. 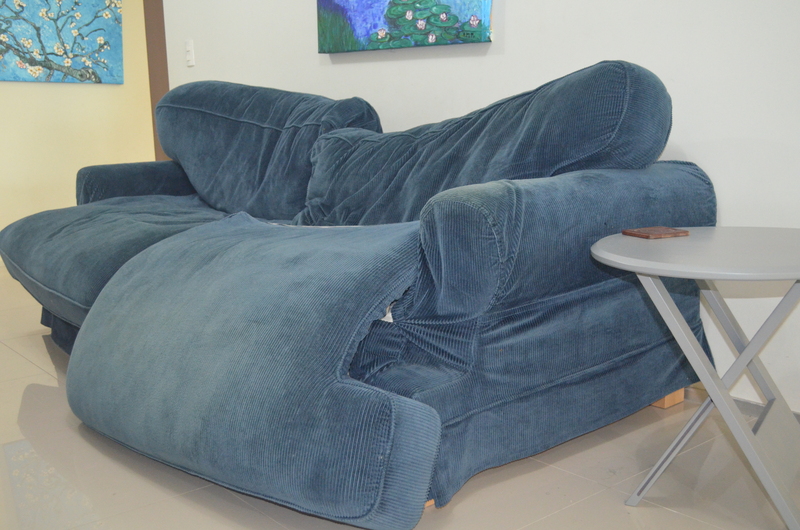 Australian made furniture. Oh yeah, and that small thing called building a house. 10. 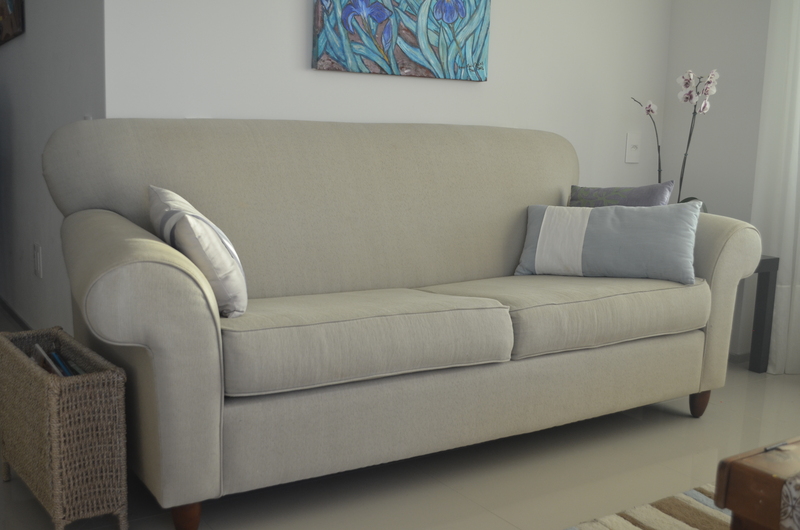 In 5 words describe your interior style. Relaxed, modern, Australian, earthy, light. Normal blogging services will resume next week. Edit:  News just in from Webb and Brown Neaves. 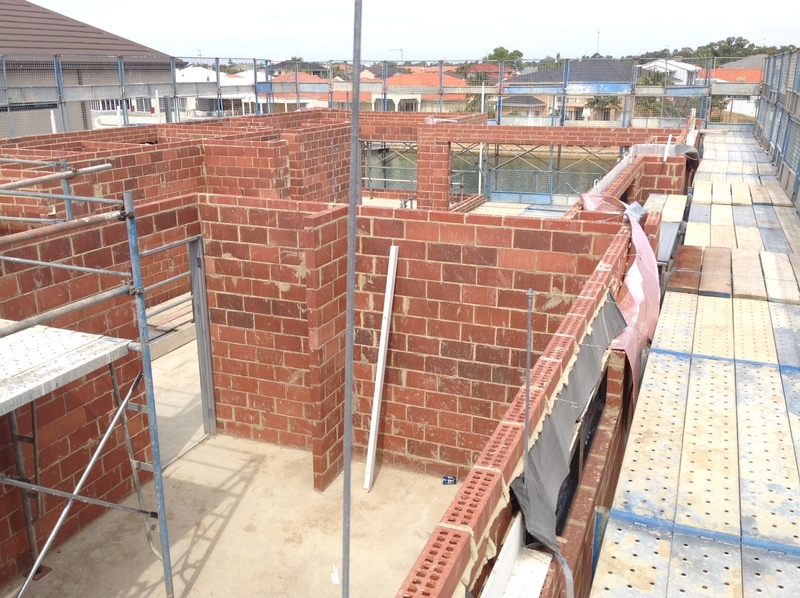 Second floor brickwork is still not quite complete. The roof carpenter is expected to start next week. Bedroom of the second little pig. An impressive amount of scaffolding. I’m quite amazed to see it all. 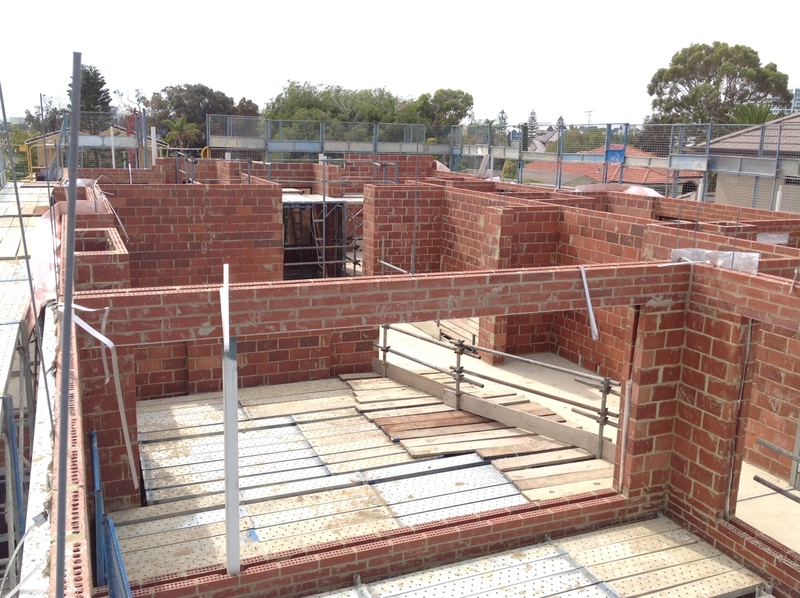 The scaffold floor will be removed to reveal a void space above the ground floor living area. It’s starting to look large. Reader vote: next week’s post. The indecisiveness is spreading. First it was the splash back, then the pendant lights, and now I can’t even decide what to write about next. Here’s a few ideas that are circling in my head. Take your pick, or suggest something new. You have a few days to place your vote. Other topics that I have up my sleeve in the “coming soon” file are vegetable gardens, the post-handover plan and interior paints, but I’ve got some more research to do before they go live. By the way, if you are looking for some good pinning opportunities this weekend, checkout Webb and Brown-Neaves’ latest display home, The Islander. The interior design is definitely my favourite of all their displays so far. I love a bit of “beach” without the kitsch. Pay close attention to the tiles, some may look familiar. I’m not exactly sure what the builders are up to right now, but the odd little bit of “behind the scenes” information is sneaking into my inbox. What are the soak well requirements for the pool? Can I confirm that I want the front door stained not painted? And, most excitingly, the names of our Construction Liaison, the “Starts Manager” (in charge of site works and slab), and Site Supervisor. Any moment now there will be a start date! I thought I’d share my itinerary wish list with you, in case you have some recommendations for me. West Elm. (Pictured top.) I’ve seen a lot of pinning action on some lovely West Elm furniture and their prices are not too shocking. I want to see how it looks in reality. Williams and Sonoma. When I lived in Canada I visited this paradise for home cooks regularly and was always in awe of the quality cookware. Can the Australian store lives up to my expectations? The Society Inc.. Sibella Court’s little office in Paddington. This lady has mastered the art of making clutter look good. I need lessons. Zaffero Pop Up Shop. I’ve never been to a pop up shop before, but in a world of online shopping, it’s a great idea. If I’m going to spend a few hundred dollars on a light fixture or rug, I really want to see it first. This way, I can look now, buy later. Matt Blatt. The king of replicas. Will they fool me? I hope so. David Jones. Australian-made towels by Country Road are currently 50% off. Adriano Zumbo. With all that home decorating research, I’m going to need some sustenance. Zumbo is everywhere these days (Tim Tams anyone?) but I like the tiny, original store in Balmain. Hardly revolutionary, I know. But don’t forget I’ve been in the depths of wild Brazil (slight exaggeration) for the past 8 months, deprived of shops tailored to Australian taste. 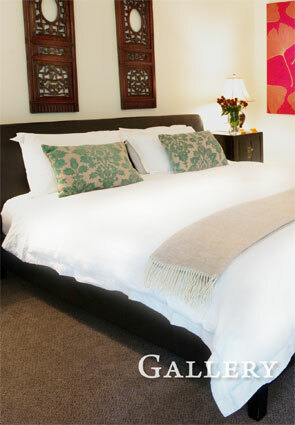 Our accommodation at “The Provenance“, Beechworth. On my last visit to Beechworth, 20 years ago, my highlights were sticky beesting from the Beechworth bakery and viewing the jail where the infamous bushranger, Ned Kelly, was held. Beechworth is a gold rush town that has maintained many of its beautiful old buildings. It’s now also a gourmet destination and I’m hoping that it will have a few cute antique and home wares stores for browsing. H and M. Trendy and cheap clothes and home wares. I’m interested in their linen bedding and curtains. Corporate Culture. One of the stockists for the gorgeous Coco pendant that is in top spot for contention as our dining room pendant light. At $1500, I have to see it first. Fonda Mexican Restaurant. The interior design of this restaurant has been a bit of a talking point, but I suspect my family will be more interested in the guacamole and margaritas. I’d love a little more “Australian-made” on the list. I suspect we’ll make a few discoveries as we wander the streets of Melbourne. Do you have any favourites to share? I won’t bore you with another shopping post, but if I find any treasures, I’ll share them on House By The Water’s Facebook page.